NEW DELHI: The 50-share Nifty index is expected to open higher on Tuesday after lower International Monetary Fund (IMF) global growth forecast raised hopes of more stimulus measures from central banks. Here is a list of seven stocks that are likely to be in action in morning trade today. 1) Axis Bank Ltd will be in focus ahead of its quarterly results. According to ET Now poll, the bank is expected to report a net profit of Rs 1140.30 crore for the quarter ended June 2012, up 21 percent, compared to a net profit of Rs 942.40 crore in the same quarter last fiscal. 2) Nalco Ltd, after the company has joined the fray along with a clutch of Japanese firms to operate a 2.25 lakh-tonne smelter unit in Indonesia, said sources close to the development. 3) Tata Steel Ltd, after the company has agreed to sell its 50 percent stake in Dutch ferrous and non-ferrous metals recycling firm HKS Scrap Metals Co to Euro Scrap Alliance (ESA), a unit of Germany's TSR, for an undisclosed amount. 4) Tata Coffee Ltd, after the company reported an over two-fold increase in its consolidated net profit for the quarter ended June 30 at Rs 31.84 crore on account of better sales in the three-month period. The company had posted a net profit of Rs 13.59 crore in the April-June period in 2011, Tata Coffee said in a filing to the BSE. 5) Exide Industries Ltd, after the company said its net profit for the first quarter ended June 30 has dipped by 6.87 per cent to Rs 152.03 crore mainly on account of increased raw material costs and exchange losses. The company had posted a net profit of Rs 163.25 crore for the corresponding period of previous fiscal, Exide Industries said in a filing to the BSE. 6) Adani Enterprises Ltd, after the Gujarat-based Adani group's flagship firm, is in discussions with the Mozambique-based NCondezi Coal to acquire a minority stake in its coal assets. "The deal with the AIM-listed NCondezi is expected to be in the range of $350-400 million (Rs 2,000-2,200 crore). Standard Chartered Bank is advising NCondezi on finding a partner," media reports indicated. 7) Sugar companies will be in focus after the government has decided to impose 10 percent import duty on sugar in view of surplus production. "The food ministry had proposed 10% import duty on sugar after zero duty regime expired on June 30," according to media reports. 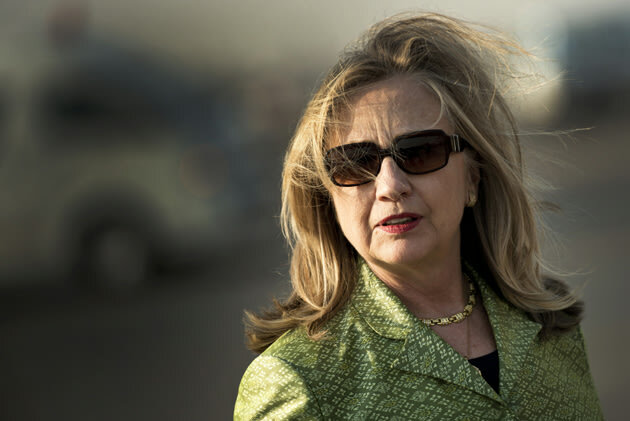 Hillary Clinton calls Romney ads featuring her a ‘waste of money’ - YAHOO! Secretary of State Hillary Clinton says Mitt Romney is wasting his money running ads using footage of her scolding her former rival Barack Obama during the 2008 campaign. In an interview with CNN's Elise Labott, Clinton says she hasn't personally seen Romney ads but predicts they'll have little impact on voters ahead of November's election. "I am out of politics, and I haven't seen any of the ads that you're talking about," Clinton told CNN. "But I have to say it's a waste of money. Everybody knows I ran against President Obama in 2008, that's hardly news. Everybody knows we ran a hard fought campaign and he won. And I have been honored to serve as his secretary of state." Clinton has shown up in two separate Romney ads in recent weeks, both spots using footage of her admonishing Obama during the hotly contested 2008 Democratic presidential primary for distorting her record. Romney used Clinton to argue that Obama is employing similar falsehoods against his 2012 campaign. Australian stocks extend gains after the RBA hints that there won't be more rate cuts anytime soon. Two non-executive board members left Quickflix today - Donald Campbell and Simon Sutton - and one was replaced. The exits take the board back to its traditional composition of five directors. Mr Campbell resigned to concentrate on his US investment fund Guaranty Finance Investors, which has an 8 per cent stake in Quickflix. Mr Sutton is president of Home Box Office (HBO) International and Content Distribution and joined the board when HBO took a 10 per cent stake in Quickflix earlier this year. He nominated Henry McGee as an alternate director when he was unable to attend meetings. Mr McGee becomes a non-executive director today. Mr McGee is president of HBO’s Home Entertainment division. 2.58pm: We're also running a poll on that last story - Petrol price fix? 2.47pm: Aside from this blog, BusinessDay's most-read story today is this one about fuel prices: Petrol prices stir ire. Drivers should brace for higher petrol prices in the weeks ahead amid renewed concerns oil prices may have been manipulated by reporting agencies in recent years. “Motorists in mainland capital cities should expect to see pump prices between $1.30-1.50 a litre rather than $1.15-$1.35 in (the) coming fortnight,” said CommSec chief economist Craig James via Twitter. The forecast for higher prices comes after global growth worries had sent average petrol prices lower for nine weeks straight from $1.52 per litre on May 13 to $1.34 last week, according to data from the Australian Institute of Petroleum. Mr James said the current stability in the European debt crisis and hopes for stronger Chinese economic growth may underpin rising petrol prices in the weeks to come. 2.34pm: Lest anyone get too optimistic, though, there are a few weak spots in the economy, namely non-mining construction. Australia’s worst building market since 2001 is driving CSR’s bond risk to a record relative to global peers as the building materials company warns of sagging profits and the government’s carbon tax drives up costs, Bloomberg reports. Credit-default swaps insuring CSR’s debt surged 42 basis points last week to 183, the worst performer among Australian companies tracked by CMA. The contracts cost 80 basis points less than an index of global homebuilding-goods suppliers on July 13, the smallest advantage since the gauge started in May 2009, according to Bloomberg data. CSR, the only building materials supplier in the nation’s benchmark corporate CDS index, said this month its markets were under “extreme pressure” after Australian housing starts slid to an 11-year low in the first quarter of 2012. 2.23pm: The Aussie dollar is holding its own against the greenback, remaining above the $US1.03 mark after the relatively upbeat RBA minutes downtailed with growing global hopes of more Fed stimulus. “We remain of the view that the overnight cash rate will eventually come down by 75 basis points to a low of 2.75 per cent,” said Westpac chief economist Bill Evans. Mr Evans has been among the most pessimistic - let's see if this call is correct. Investors see big banks as riskier than before the first flames of the financial crisis flared five years ago and probably always will, according to a new report from Moody's Analytics, a sister company of the bond-rating agency. Risk premiums for bank debt are "highly unlikely ever to return to their former levels, both in the US and Europe," according to the report by a team led by David Munves. Not surprisingly, given the size of the big four, the banks account for the lion's share of the market's meagre 2.2 percent advance in 2012. Specifically, if the ASX200 is up 90 points, CBA alone has contributed 38 points, Westpac 32 points and ANZ 26 points. 1.54pm: Fortescue shares, meanwhile, have clawed back losses after the miner said it may need to borrow another $US1 billion to cover cost blowouts on its expansion project - as BusinessDay's Peter Ker reports. Anyway, here's a Bloomberg chart of how FMG has fared over the past year. Slightly tricky to see the colours, but basically, FMG and BHP's total return over the past year is about equal at minus-26 per cent. 1.43pm: In fact, anticipation of that Bernanke testimony seems to be trumping all other concerns right now, and helping to send stocks to fresh intra-day highs here. ASX200 up about 1.1% which, if maintained, would be the best one-day gain this month. 1.30pm: Eyes will soon turn to the US and Fed chief Ben Bernanke's testimony to Congress amid speculation he could take a further step toward fresh quantitative easing. Should he disappoint and just repeat that Fed will take further easing measures if necessary, that could see risk assets and the Aussie dollar pull back, Reuters reports. 1.23pm: Asian stocks are also higher, rising for a third day as an unexpected drop in US retail sales stoked speculation Federal Reserve chairman Ben Bernanke will hint at further stimulus today. Japan’s Nikkei 225 is up 0.6% after markets closed yesterday for a public holiday. South Korea’s Kospi is 0.6% stronger and Hong Kong’s Hang Seng has risen 1.4%. 1.14pm: Oil is up in Asian trade on hopes for a Chinese stimulus package and simmering geopolitical tensions following reports of a US Navy ship firing on a boat off Dubai's coast, analysts say. New York's main contract, light sweet crude for delivery in August is up 17 cents to $US88.60 and Brent North Sea crude for September delivery has gained 30 cents to $US103.67. Lacklustre growth figures from China leading to hopes for government intervention, coupled with the US Navy incident in the geopolitically sensitive Middle East, were supporting crude, Phillip Futures says in a report. "Oil prices... (were) lifted by hopes that signs of economic slowing will prompt stimulus measures, especially in China, and by news a US Navy vessel off the United Arab Emirates fired on a fishing boat that failed to heed warnings," the report says. 1.07pm: More on Fortescue... the miner says it may look to borrow “up to $US1 billion” in coming weeks in a bid to cover a $US600 million cost blow-out on its iron ore expansion project, Peter Ker reports. The blow-out was revealed this morning as part of an otherwise strong quarterly production report for Fortescue, which achieved its goal of exporting more than 55 million tonnes in the year to June 30. Despite opening higher, Fortescue shares have slipped to be four cents lower than Monday’s closing price at $4.60. Fortescue’s chief financial officer Stephen Pearce says the company is still considering options for sourcing the funds, but confirmed that the company will overshoot the blow-out and look to raise $US1 billion. He says the company will consider “the normal range of options in terms of discussions with banks or other funding parties”. 1pm: CMC Markets chief market analyst Ric Spooner says the dollar rose just before the release of the RBA's minutes and has remained in a robust position since then. ‘‘There was sharp jump in the Aussie dollar just prior to the Reserve Bank minutes coming out,’’ he says, "and we’ve held those gains - the inference is that the tone of the minutes was more neutral than easing’’. 12.55pm: In the US, politicians have accused the global bank HSBC of opening the doors of the financial system to terrorists, drug dealers and money launderers in a hard-hitting report. Senators found the London-based lender allowed affiliates in countries such as Mexico, Saudi Arabia and Bangladesh to move billions of dollars in suspect funds into the United States without adequate controls. At a time when the banking sector is already under fire for manipulating interest rates and the reckless trades that led to the 2008 financial crisis, HSBC moved quickly to apologise and promise to improve its procedures. "In an age of international terrorism, drug violence in our streets... and organised crime, stopping illicit money flows that support those atrocities is a national security imperative," says Senator Carl Levin. "HSBC used its US bank as a gateway into the US financial system for some HSBC affiliates around the world to provide US dollar services to clients while playing fast and loose with US banking rules," his statement says. 12.46pm: Australia's international merchandise imports on a balance of payments basis fell 2 per cent in seasonally adjusted terms to $21.68 billion in June, compared with $22 billion in May, Reuters reports. The ABS said imports of intermediate goods fell 6 per cent, driven by a 20 per cent, or $729 million, drop in fuels and lubricants. Imports of capital goods rose 6 per cent, or $338 million, extending their strong run as the mining sector spends big on new projects. Imports of consumption goods dipped 2 per cent, or $124 million. In original terms, imports fell 4 per cent to $19.92 billion, mainly due to a drop in the fuels component. ‘‘I don’t think there is any real need to cut rates in the near-term," said Mr Mumford. Bank of Queensland has offloaded $156 million worth of problem commercial property loans to investment bank Goldman Sachs, removing a key uncertainty for the regional lender. BoQ shares were recently 1.8 per cent higher for the day at $6.77. The loans rank among BOQ’s three largest impaired assets, which are secured by shopping centres in Queensland and Victoria. The fourth loan is a smaller commercial property development. BOQ said the sale of the four loans - for an undisclosed amount - will have no material impact on its results for the year to end August. Media giant News Ltd has won a case against the Australian Tax Office after the Federal Court found that the ATO's assessments had been excessive. The decision, handed down this morning, means News can claim $2 billion in tax deductions from currency exchange losses. The losses totalled $629.6 million in 2001 and $1.42 billion in 2002. Justice Nye Perram ruled the tax office's decision to object to News claiming the deductions would be set aside. The ATO was also ordered to pay News' costs. Thirty companies associated with News were involved in the litigation. 12.16pm:Gains are now across the board, with materials up 0.6% after being flat early. Financials and energy are also up 1.2% and gold miners 2%. Interesting to see CBA back above the $55 mark - a level not seen seen February 11, 2011. Not surprisingly, CBA is the biggest contributor to the overall market's advance, accounting for about one-sixth of the gain. 12.07pm: The dollar is up to about $US1.03 on the RBA minutes. Investors tracked by Credit Suisse cut their view on the likelihood of an August 7 rate cut to under a 50-50 chance. It was about a 63% chance before the release of the minutes. 12pm: New Corp has won a $2 billion dispute with the Australian Taxation Office involving currency exchange losses beginning in 1989. More soon on this one. 11.55am: The market, meanwhile, is heading higher. The ASX200 is now up 35 points, or 0.9%, to 4140.1. 11.52am: Here's a link to the minutes of the RBA's meeting on monetary policy. 11.47am: Sales of new motor vehicles in Australia fell 0.6% (seasonally adjusted) in June, official data shows. In June, 91,375 new vehicles were sold, seasonally adjusted, compared to a downwardly revised 91,920 in May, according to ABS data. In the year to June, new motor vehicle sales rose 18.4%, seasonally adjusted. Australia’s central bank kept borrowing costs unchanged this month as domestic job growth and previous interest-rate reductions help the local economy weather global disruptions, minutes of its July 3 policy meeting show. Australia grew at the fastest annual pace in the developed world in the first quarter, and government reports since RBA Governor Glenn Stevens’s latest policy decision have painted a mixed picture of the economy. Retail sales rose by more than twice the pace economists forecast and consumer confidence strengthened, while the unemployment rate increased in June and home-loan approvals sank. In their debate, the RBA officials indicated concern that the recovery in the U.S. had slowed and European activity declined, while data for May suggested China’s economy wasn’t slowing as much as previously anticipated. 11.34am: The dollar has jumped half a US cent on the release of the RBA minutes - it's now at $US1.029. "Members continued to view it as appropriate for interest rates to be a little below average given evidence of slower global growth and the low rate of inflation in Australia. But with a material easing in monetary policy having occurred over the preceding six months or so, and with recent signs that the domestic economy had a little more momentum than had earlier been indicated, members saw no need for any further adjustment to the cash rate at this meeting." 11.25am: RBA minutes about to land. Dollar at $US1.025 precisely, and chance of a rate cut on August 7 put at 63% by those money market investors. 11.22am: Ford has announced it will cut 440 manufacturing jobs as it downgrades production. The jobs will mostly come from the manufacturing parts of the business, the company says. Voluntary redundancies will be offered initially but workers may then be sacked if the required 440 reduction is not reached. 11.18am: The chief executive of PaperlinX has quit as the troubled paper merchant sold more of its overseas operations to complete a strategic review. PaperlinX says chief executive Toby Marchant will leave the company at the end of July. ‘‘We have reached a major turning point in the transformation of PaperlinX, and the board and I have agreed that it is an opportune moment for me to step down as chief executive,’’ Mr Marchant says. Shares in PaperlinX are down 0.6 cents, or 13.04%, at 4 cents. 11.08am: A man who was working on an OceanaGold site in the Philippines has died after a severe storm. The gold producer says it is investigating the incident, which caused the Filipino man’s death at the Didipio Project site in the Northern Philippines. OceanaGold’s chief executive, Mick Wilkes, offered his condolences to the man’s family and friends, and says counselling services have been arranged for them and his fellow employees. “We are extremely saddened by this tragic event. Safety will always remain a top priority of the company to eliminate harm to our employees, contractors and local community,” he said in a statement. The man was employed by one of OceanaGold's contractors. 11am: City Index’s chief markets analyst Peter Esho says Fortescue Metals’ strong quarterly results this morning could be the first sign of a turning point for materials stocks, and by extension, the share market this year. Mr Esho says Fortescue’s production results are positive for iron ore, and are helping to pull up Rio Tinto’s share price. He forecasts a bounce in the price of all materials stocks in the next six months. He says while BHP Billiton is still dragging the market down, this will pass as cautious investors look beyond short-term concerns. 10.51am: RBS Morgans private client adviser Bill Bishop says the local market has gone against the negative trend of Wall Street and Europe. ‘‘It was a rather off-colour market overseas,’’ he says. 10.38am: Car company Ford is expected to announce hundreds of job losses at two Victorian plants. A report says the company is to shed 440 jobs spread evenly across the Geelong and Broadmeadows plants. A Ford spokeswoman says the company will release a media statement at 11am (AEST) and will not comment before then as talks were being held with workers. 10.30am: While Fortescue heads higher, BHP is off 1% and rival Rio Tinto is flat at $54.49. 10.25am: Stocks are now heading higher. The ASX200 is up 10.6 points, or 0.3%, to 4115.7. Among the sectors, miners are down 0.2%, financials are up 0.6% and industrials are down 0.2%. 10.20am: Fortescue Metals Group has achieved its long promised goal of exporting 55 million tonnes of iron ore in a 12 month period, after an excellent June quarter made up ground that was lost during a cyclone-ravaged start to 2012, Peter Ker reports. But that strong result has been overshadowed by a $600 million cost blowout on the company’s expansion project. The expansion to 155 million tonnes – due by this time next year – will now cost $US9 billion, after the company revealed today it could no longer contain costs within the previous guidance of $US8.4 billion. Despite the blowout, Fortescue shares are up 10 cents, or 2.2 per cent, to $4.74. 10.14am: Treasurer Wayne Swan has ruled out increasing the GST despite former treasury secretary Ken Henry warning that Australia will have to rely more on the consumption tax. Dr Henry, who was the architect of the Henry tax review, told a forum in Canberra on Monday that he was pleased to see a discussion occurring on possible changes to the GST. Many economists and academics are calling for the GST base to be expanded or the rate increased, or both. But Mr Swan has ruled out those possibilities this morning. ‘‘This government will not be broadening the base or raising the rate of the GST because it hits those on the lowest and fixed incomes hardest,’’ he's told ABC Radio. 10.10am: Agricultural products provider FarmWorks Australia has appointed a former general manager of Elders, David Jones, as its new chief executive. Mr Jones has worked in the Australian agribusiness industry for 27 years, including 15 years in executive management roles. He was previously the general manager of Elders for Western Australia and was a national sales manager for an Australian-based agricultural crop protection business. 10.04am: Here's an early take on the market: the ASX200 is down 2.2 points, or 0.1%, to 4102.7. 9.55am: The drought scorching the US midwest is spanning 55 per cent of the contiguous United States and is the worst since 1956, the National Oceanic and Atmospheric Administration says in a report posted on its website. The agency says based on the Palmer Drought Index, the 55 per cent coverage was the largest since December 1956 when 58 per cent of the contiguous United States was in moderate to extreme drought. US corn prices (or maize, as they’d say) has risen another 2% after the US Department of Agriculture said crop quality fell the most in nine years. 9.47am: Citigroup reckons falling commodity prices will prompt big miners to scale back their investment spending, or capex outlays, by 10% in 2013, according to Bloomberg. Citigroup says 56% of those surveyed in the second quarter of 2012 said it was getting harder to fund equipment purchases, up from 40% three months earlier. The survey doesn’t appear to have singled out Australia but the oft-cited figure of some $500 billion in mining investment in the pipeline might have to be revised. Reuters, meanwhile, is reporting that Rio Tinto may be looking to cancel a billion euro project as part of the pullback. 9.42am: JPMorgan reckons Rio Tinto is undervalued relative to BHP Billiton. 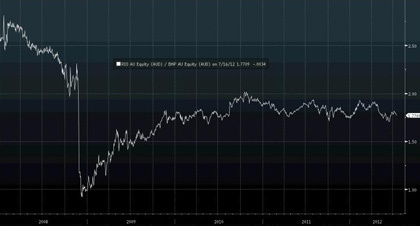 The chart below from Bloomberg data shows the ratio of BHP shares to Rio since the start of 2008, including the sharp fall in the ratio in late 2008 when BHP’s bid for Rio collapsed. Since then, the relative price has moved in a fairly tight band. JPMorgan, meanwhile, reckons if you’re looking to invest in one or the other, Rio is the better bet. It cites Rio’s relatively large exposure to iron ore prices and the fact that Rio’s share price implies an iron-ore price of $US90 a tonne, while BHP’s implies $US110 a tonne. Rio will be in the news later today when it reveals June quarter production while BHP will follow up with its latest quarterly output update tomorrow. 9.37am: IG Markets analyst Chris Weston says the market is expected to open flat after disappointing US retail sales figures overnight. He says a few brokers have ratcheted down their estimates for the US’ second quarter of GDP. Mr Weston says stocks were likely to trade within a narrow range throughout the day, as investors only had minutes from a meeting of the Reserve Bank and production reports from Rio Tinto and Fortescue to look to for guidance. Neither of these were likely to have a significant impact on prices, he says. “The minutes today could be an Aussie dollar positive in the sense that it might see some of those (interest) rate expectations being priced out. 9.30am: Hi everyone. Welcome to the Markets Live blog for Tuesday. Japan’s Nikkei 225 Stock Average (NKY) rose a second day after the International Monetary Fund raised the nation’s growth forecast. Gains were limited as U.S. retail sales unexpectedly slid and the yen rose to a one-month high against the dollar. The Nikkei 225 rose 0.6 percent to 8,779.32 at 12:34 p.m. in Tokyo. The broader Topix Index (TPX) rose 0.1 percent to 747.09 after falling as much as 0.4 percent earlier as it reopened from a three-day weekend. The gauge fell for a seventh day through July 13, the longest losing streak since April. The Topix rebounded about 7 percent since June 4, when it closed at its lowest since 1983, as concern eased about Europe’s debt crisis after bailout terms were eased for lenders and on optimism central banks around the world will ease policy. Shares on the index are valued at 0.9 times book value, compared with 2.1 times for the Standard & Poor’s 500 Index and 1.4 times for the Europe Stoxx 600 Index. A number below one means investors can buy companies for less than the value of their assets. Japan’s stocks rose after the International Monetary Fund raised the nation’s growth forecast for 2012. The economy will expand 2.4 percent this year, up from a 0.4 percent estimate in April, the IMF said. It cut its global economic growth forecast as Europe’s debt crisis prolongs Spain’s recession and slows expansions in emerging markets. Futures on the S&P 500 (SPXL1) added 0.5 percent today. The gauge lost 0.2 percent in New York yesterday after U.S. retail sales unexpectedly dropped 0.5 percent in June. Exporters to the U.S. dropped after the yen reached 78.69 against the dollar yesterday, the strongest since June 18. A stronger Japanese currency reduces the value of overseas earnings for exporters when repatriated. Hokuriku Electric led declines among utilities on a report of an active fault line beneath one of the company’s reactors and after thousands of Japanese rallied in Tokyo to protest nuclear power. The Nikkei 225 Volatility Index (VNKY) lost 3.9 percent to 18.23, indicating traders expect a swing of about 5.2 percent on the benchmark gauge over the next 30 days. Trading volume on the Nikkei was 3.6 percent above the 30-day average.